The poultry meat sector is one of Britain’s favourites because it is versatile, nutritious, affordable and trusted. Over half of the meat consumed in the UK is chicken, turkey, goose and duck. What is included in the poultry industry? The poultry industry covers chicken, geese, turkey and duck. A broiler is a male or female chicken that is bred and raised specifically for the production of meat. Many typical broilers have white feathers (unlike laying hens which are nearly all brown). How much chicken does the average Brit consume each year? The average Brit consumers 35kg of poultry meat every year. How does the UK poultry meat industry compare to others? British farmers pride themselves on having some of the highest welfare standards in the world. The UK is the 3rd largest overall poultry meat producer in the EU, as well as the 5th largest producer of duck and the 6th largest producer of our seasonal favourite turkey. What is the value of the poultry meat industry to the UK economy? British farmers rear 1 billion broilers for food every year, which contribute £5 billion to the UK economy. What is the value of poultry meat exports to the UK economy? The value of UK poultry meat exports was £500 million in 2017. How many jobs does the poultry meat industry provide? The poultry meat industry supports over 37,000 jobs, ranging from farmers and farm managers to processors, haulage companies and lorry drivers. In addition to this, 13,000 workers are employed for seasonal, Christmas poultry production. How do British farmers make sure that their birds are ‘happy’? The health and welfare of their birds is a farmers’ number one priority. They are raised in environments where they have access to food, water, warmth and plenty of space. The majority of sheds housing poultry have windows to allow natural daylight in. Every farmer has their own creative ways to entertain the hens and keep them occupied. This might be to hang pieces of string around with CDs attached for them to peck, give the birds toys to play with, or add bales of straw or shavings for the birds to stand on . How do British farmers ensure that there birds have enough space? A bird’s welfare is all farmer’s number one priority, and there are several rules and regulations in place to ensure the bird’s welfare. UK, Red Tractor and RSPCA standards make sure that the stocking density is controlled and managed. In simple terms this means that there are not too many birds in a given space. What standards do British farmers have to adhere to? Over 90% of poultry meat farms are Red Tractor assured. This means that the way they rear their birds meets strict standards of animal welfare, safety, hygiene and traceability. Red Tractor strictly monitors the scheme and any farmers found not to be adhering to standards are removed from the assurance scheme. Red Tractor farms are independently audited every year to ensure they are complying with the scheme rules. How a chicken is housed depends on the choice of the farmer and the consumer demand. There are 3 main types of production systems in the UK. 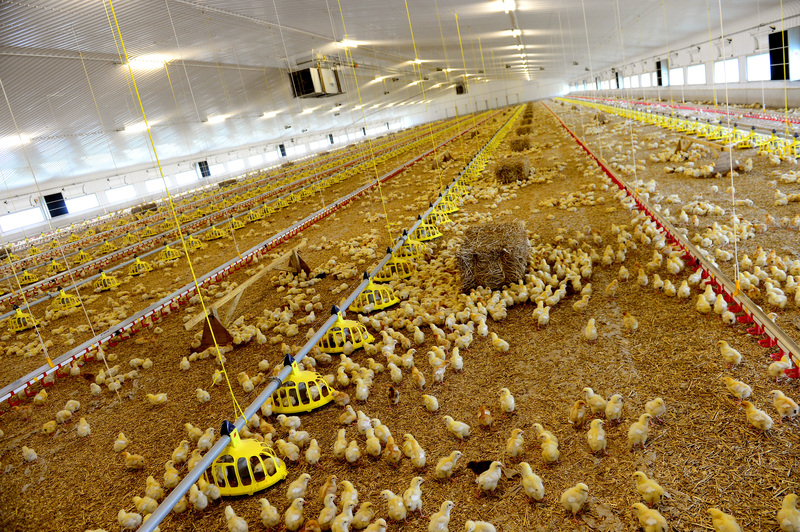 Standard indoor: Indoor broilers are raised in large, open structures. Floors of these houses are covered in bedding material with access to feed and water. Keeping birds inside protects them from predators and can be equipped with curtain walls, which can be rolled up in good weather to admit natural light and fresh air. Optimum conditions in the shed can also be maintained for the birds health and welfare. Free range system: A free-range broiler must have continuous daytime access to the outdoors, as well as nest boxes, adequate perches and floor space. Organic: Organic broilers are always free range but are also fed an organically produced diet and ranged on organic land. Organic birds are reared to a lower stocking density than free range and for a longer period of time. Over the past six years, the use of antibiotics in the poultry meat sector has declined by more than 80%. Outside of the EU, in countries where regulation is less tight, antibiotics are used extensively and treatments like chlorine washes are carried out on poultry meat to compensate for poor hygiene behaviour in the supply chain. How can I support the British poultry industry? When shopping in the supermarket, remember to check the food labels for the Red Tractor logo and British flag, and if buying from a local butcher you can always ask where the meat has come from. Take a look at our Buying Guide to find out which retailers are backing British poultry.